So, in other posts I've gone on about how much I love pretzels. It's just part of growing up in southeast Pennsylvania, which I think is to pretzels as Alaska is to salmon or the Dominican Republic is to cigars. Sure, other areas produce these goods, and can do so quite admirably, but if you had to pinpoint one area that's known for having the best, you'd know where to say. That's southeast PA. In the area we have Utz, Snyders of Hanover, Snyder's of Berlin, Unique, Martin's ... all of them pretty darn good. Growing up, there used to be the "Charlie Chip" man that would come by and deliver loads of pretzels and chips to my grandmother who lived with my family. I was kinda saddened today when I tried to look them up and found out that they went out of business some years ago. Anyways, out of all pretzel types, my overall favorite probably has to be sourdough hard pretzels. They're just big, hard, super crunchy, encrusted with mini-rock salt crystals, and make you endlessly thirsty for a tall glass of lemonade or beer of your choice. I was pretty excited when on a recent Trader Joe's trip I saw these, and even a little more when I read on the side that they're "made in Pennsylvania, right in the heart of pretzel country." Boo yeah. First, a note about the box, and namely its decoration. Most of the pretzels made in PA are done by the Mennonite/Pennsylvanian Dutch crowd, or at least their ancestors, and are based on a tradition of simplicity and humility. You just get a sense of it from their products and packaging. But not these guys. First there's a pair of cherubim doublefisting straight trumpets, and then a couple lions seeming to mount a mega pretzel in the middle coat of arms style. It just seems kinda odd and boastful-esque, I don't know. For whatever reason, the analogy that came to mind was rolling through Amish country windows down, woofers up blaring Ludacris or some Biggie. Just because there isn't a law against it doesn't make it right. I'm probably making more of a deal of this than necessary. Anyways, the pretzels themselves are pretty decent. They definitely get a lot more right than they don't. They're the right size, with the right knots and exterior cracks and gashes in the dough. At first, to me at least, the crunch wasn't exactly right ... kind of almost like they were "too fresh", because they seemed to pack some level of relatively light crispiness. After a few days, though, they were right on the target. It's not a matter of getting them stale ... I don't know how to explain it right, but after being opened for a couple days that crispiness gave way to a whole 'nother level of crunch right on the money with the best. And make no mistake, these guys are super crunchy. It got to the point where Sandy and I had to eat them at the same time if we were in the same room so our own crunching muffled out each others. I think Sandy yelled at me once or twice to "stop crunching so loud on purpose, you crunchy pretzel mouth man" (or something to that effect) when she was giving her jaw a break from them, not realizing her own munching noises reminded me of a woodchipper (love you, darlin'). That's the beauty of the hearth baking process to just make the biggest, hardest, crunchiest pretzel you'll ever have. 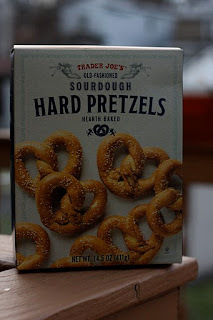 After weighing their taste against other sourdough pretzels I've had, I found these TJ delights a little bit wanting. Sandy thought they could use a little more salt. I disagree - they have about the right amount, and it's the good, big, grainy stuff. The dough with which these were made is just a little plain for my taste. It's all just basically wheat flour, salt and yeast. I'm not aware of any pretzel purity laws, and the recipe for these may well be the "old-fashioned" way of making them. I compared the ingredients to one of my favorites, Utz (whose logo is a very simple cartoon lass, thank you very much) and saw that Utz put in a lot more stuff, like buttermilk solids and butter flavor (and of course, this being America, corn syrup). Hmm. Maybe it's the Utz-style taste to which I've grown too accustomed to enjoy this Trader Joe offering as much as I otherwise should, but I just wish they offered a little more flavor, especially for something purporting to be sourdough. Amanda, one of our Facebook fans, noted that these are pretty great when dipped in some hot and spicy mustard, and I can definitely see some dip helping their cause, though generally I prefer pretzels straight from the source with no pitstops in the middle. The pretzels are definitely more right than wrong, so I'll give Trader Joe's some credit. Sandy gives them a 3 ("more salt!!!!" is basically what she said), and I'll see that and raise another spoon. At least at our local shop, the sourdough pretzels are in only sporadically, and it'd be nice to have them as a consistent offering, because then I'd be consistently crunching on them. I think I'll try them out, mostly for the loud, crunchy aggravation-to-my-family factor. I think the spicy mustard sounds good or perhaps a chipotle cheese dip. PA does have the best hard pretzels. I totally agree! As far as what song to play whilst driving windows down through Lancaster county - - I vote this one at the top of the list of both sacrilege and entertainment: http://www.youtube.com/watch?v=lOfZLb33uCg. Amanda is right on the money: no hard pretzel should be eaten without mustard. Ariel - thanks for picking up my whiff on the obvious cultural reference. shoulda knocked that fat one out of the park.